I’ve always liked a cooked breakfast. There’s nothing quite like having a big plate of warm food on a slow Sunday morning. However, having always been vegetarian and latterly vegan, it hasn’t been easy to find quality substitutes for the traditional ‘meat’ components. These days I eat a very wholefood-based diet and am not really a fan of fake meat products and lots of processed foods – I find they can make me feel a bit sluggish. So I’m really happy to have come up with this easy, colourful and healthy version of a cooked breakfast. As you’ll see, a vegan breakfast tastes great and will fill you up, without making you feel drowsy and bloated! As a side note, I am aware that the recipe and ingredient list looks a bit long. Don’t be afraid! 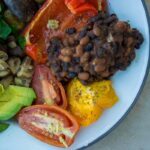 This ultimate vegan breakfast is actually pretty simple to make and only looks long because I’ve laid the ingredients and instructions for each part of the meal out separately. If it still looks daunting to you, try making just one part! 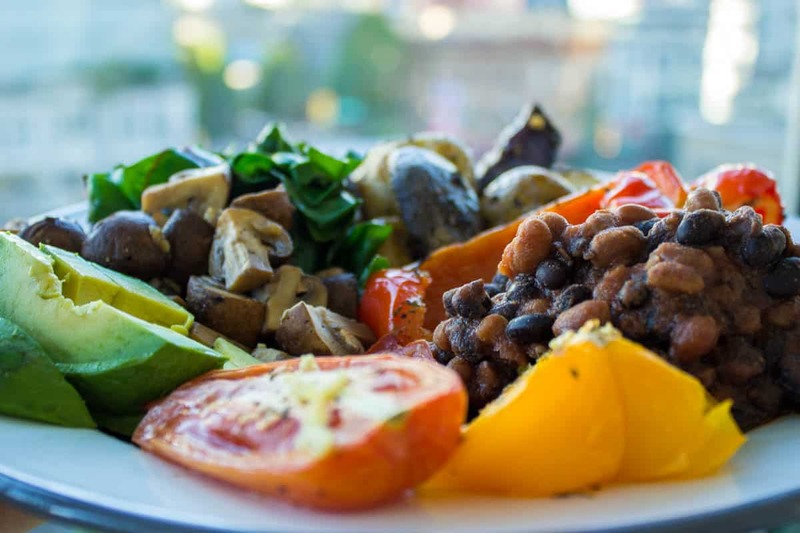 The roasted veggies and steamed greens are great as side dishes, and the baked beans or balsamic mushrooms are delicious on toast. 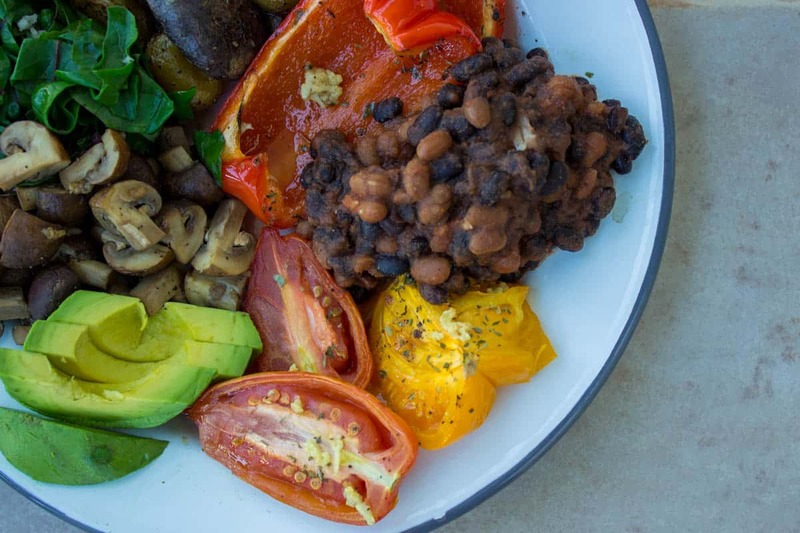 This Ultimate Vegan Breakfast is all about comfort food. Naturally gluten-free and surprisingly healthy, it will have you wanting seconds! Preheat your oven to 350°F/175°C. Toss the potatoes in the olive oil, mixed herbs, salt and pepper on a baking sheet and bake for approximately 15 minutes, or until they are just becoming tender. Remove from the oven and add the peppers, tomatoes and garlic to the same pan adding extra oil, herbs and seasoning if needed. Drizzle the balsamic vinegar over the peppers and tomatoes. Put the baking sheet back in the oven for 10-15 minutes, until the peppers and tomatoes are slightly charred and tender and the potatoes are golden brown. Remove from the oven. While the vegetables are roasting, make the baked beans, mushrooms and greens. Add the black beans, crushed tomatoes and garlic to a small saucepan and heat on a medium-low temperature until the mixture is gently simmering. Add the maple syrup, chilli powder, cinnamon, and season to taste with salt and pepper. Cover and simmer the mixture gently for about 15-20 minutes until the desired thickness and taste are achieved. Remove from the heat. Cook the mushrooms, garlic and balsamic vinegar in a small, covered saucepan on a low heat until they are softened and simmering gently (about 15 minutes). Season to taste with salt and pepper, then remove from the heat to prevent overcooking. Lightly steam the mixed greens and garlic over a pan of boiling water for about 30 seconds, until wilted. Remove from the heat and mix in the olive oil, adding salt and pepper to taste. 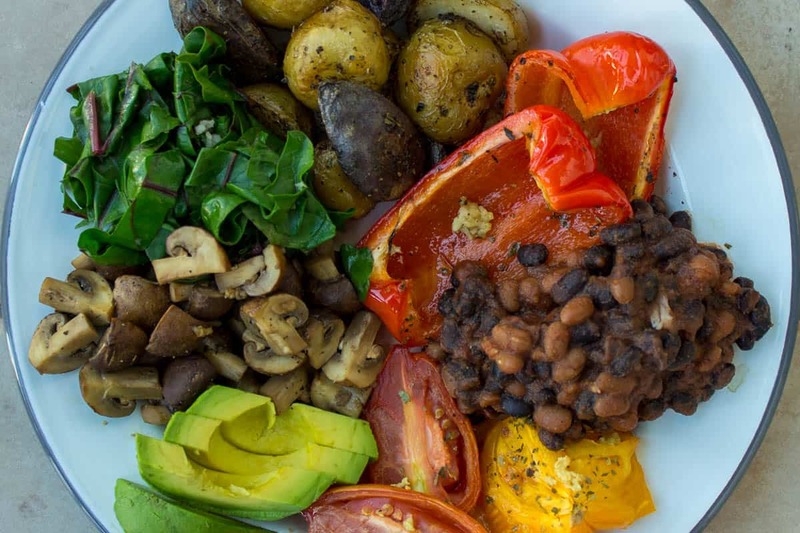 To serve, add a scoop of the potatoes, peppers, tomatoes, beans, mushrooms and greens to a warm plate and garnish with avocado slices. This breakfast is best when it’s piping hot so enjoy as soon as it’s ready! You'll notice that some ingredients - like garlic - are used repeatedly in the recipe. Prepare the full amount all at once, rather than crushing cloves separately for each stage of the recipe. It'll save you so much time!